The southwest has always held special place in my heart. Our family traveled through this region many times when we were changing locations due to military assignments. The vistas and the atmosphere near Santa Fe hold a fascination for me unlike any other region. The quality of light is amazing, and the changing colors of the desert and mountains are always a challenge. 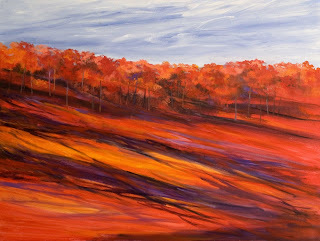 I spent many hours working on the warm and cool hues to capture the vibrancy of these landscapes. 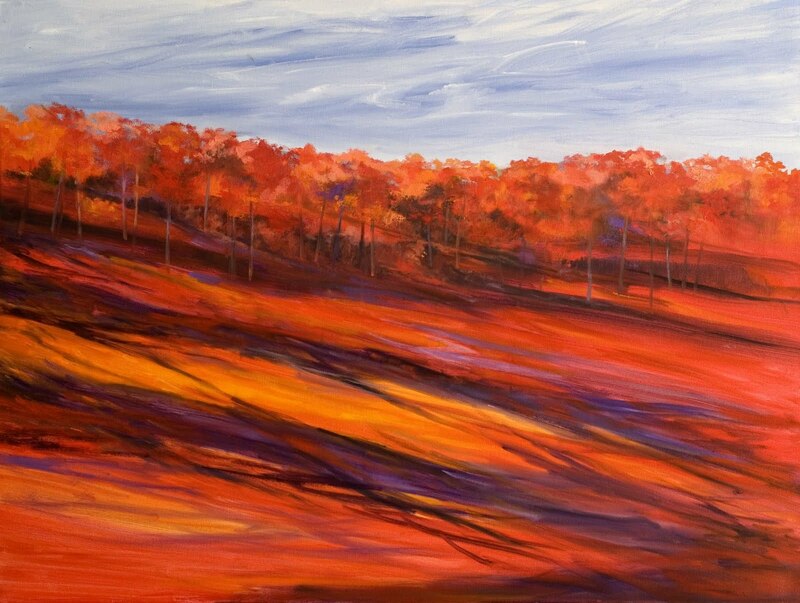 This painting is currently in Nault Fine Art Gallery in Midtown, Oklahoma City, Oklahoma. One day while driving along a highway in southern california, I saw this arroyo winding up a small canyon. The light was perfect, so my husband photographed it for me. 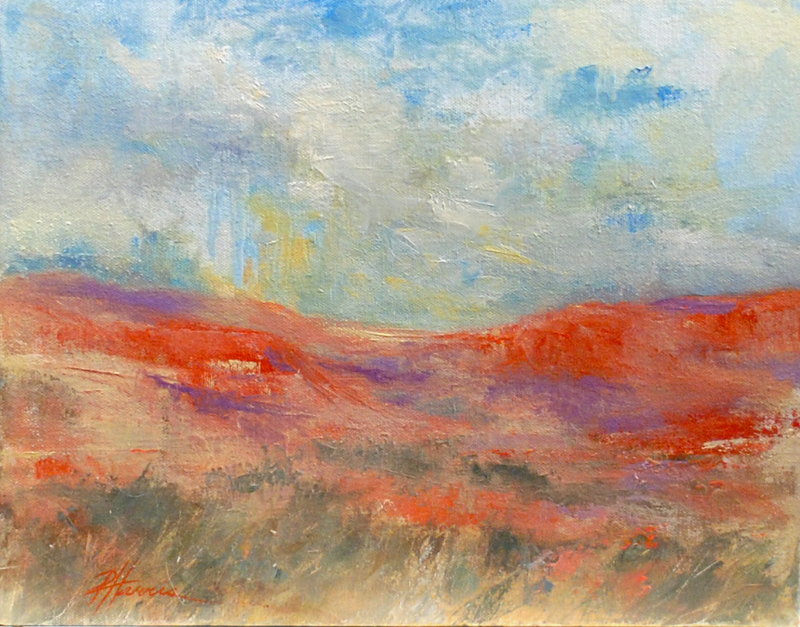 Later, in the studio I completed the painting in one day using mostly palette knife. 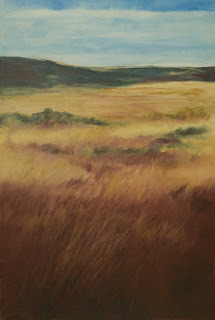 The painting is now in Dean-Lively Gallery in Edmond, Oklahoma. 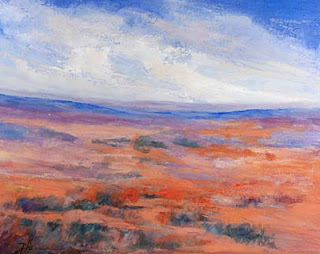 I am fascinated by the play of light and color in the southwest landscape, especially the way the sky can change so rapidly. 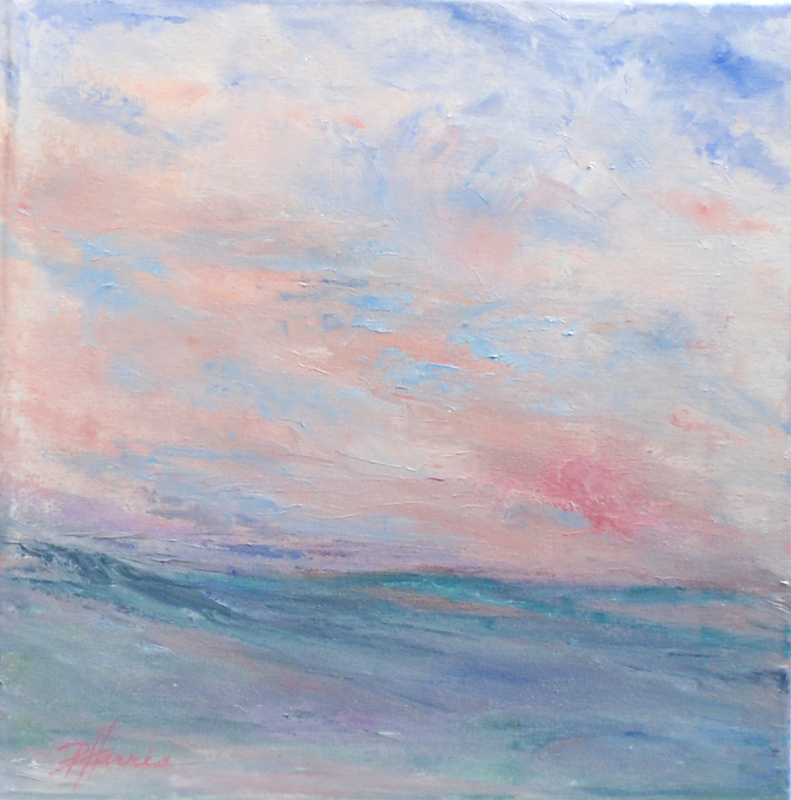 The movement of the clouds can both inspire and frustrate the artist. The hues and shades of the desert are constantly fluctuating, so you have to be quick! 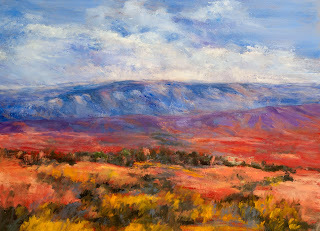 In this painting I contrasted the warm and cool colors that make the area surrounding Santa Fe, New Mexico so amazing. Our family criss-crossed the southwest many times on our vacations, so I have an abundance of photos and memories to work from. 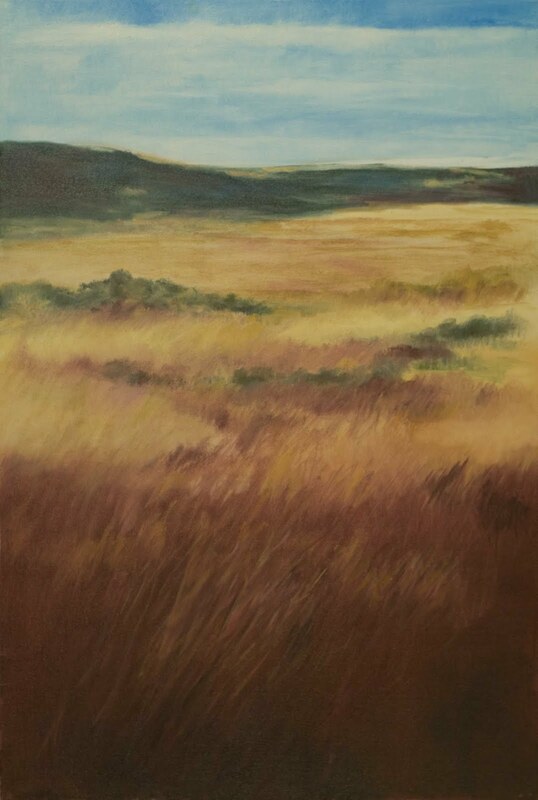 I am continually inspired by the beauty of these landscapes and the challenge to convey the emotional impact they have had on my art. I have spent many fascinating hours watching clouds, especially at the twilight time of day. I love the way they constantly change color and form. It is a challenge to capture something so fleeting. 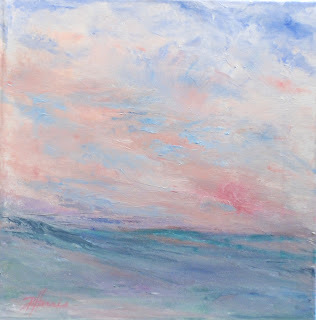 In this painting I focused on the emotional response to those last precious minutes of the evening. People have asked me if this is a landscape or a seascape. What do you think? I have been so busy that I have neglected to post some of my recent paintings. These three pieces are ones that I had in a recent show at Dean-Lively Gallery in Edmond, Oklahoma. I live in Edmond, Oklahoma where our family settled after being stationed in several states and also the Republic of Panama. Because my husband was an Officer in the Marine Corps, our family had the opportunity to live in a variety of locations and cultures. 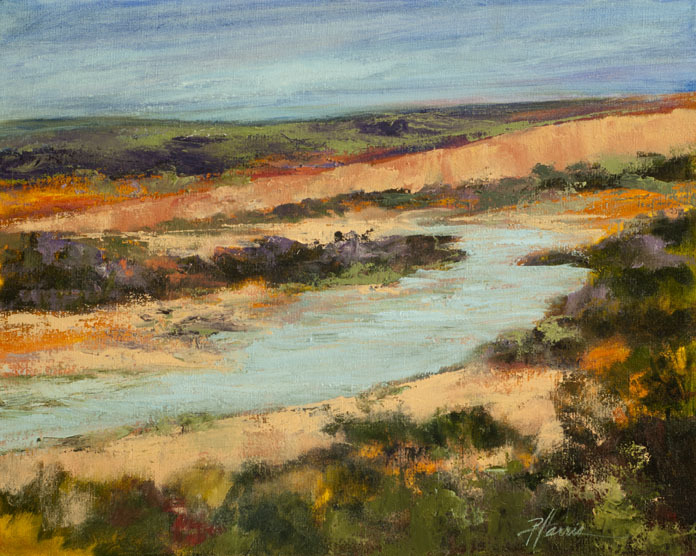 I have photographed, drawn and painted many different subjects, but my main interest is the landscapes and vistas we have seen in our travels. Art has always been an important part of my life and I hope this blog inspires me to create at least one new painting a week.